To order NAMET IT personalized Sew On Polyester Labels online now and get free shipping just fill in the details below and click add to cart. 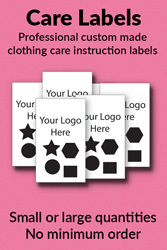 ** If you don't like sewing please check out our popular Iron-On Clothing labels. These are our best seller! So quick and easy to use. And guaranteed to last in a commercial wash and dryer. 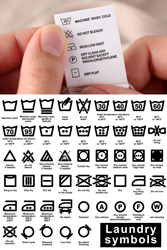 Our standard Sew On - Polyester labels above are suitable for text only. They can still be used as a care label but the printing options are limited. They work well for customers on a tight budget or if you are wanting to print something basic. OR ask us for three lines of text - by writing in the comment box. All labels must be landscape. We will centre the text and you can sew each side or sew all around. You can also choose your own fonts by telling us in the comment box. Product arrived in good time and was what we wanted so happy with the purchase thanks. These are perfect to use for the items I was re-selling. The name was printed really clear/bold on the white background so made it easy to read/identify. Have worked well thanks. These are quite hard to hand sew but have done a good job on the items I needed to label. To be honest I used mostly iron on and a small pack of these for the bits I wanted to remove.